Hugo França was born in Porto Alegre in 1954. In search of a life closer to nature, he moved to Trancoso, Bahia, in the early 80's, where he lived for 15 years. There, he realized the degree of waste in the extraction and use of wood, the experience that guided his work. 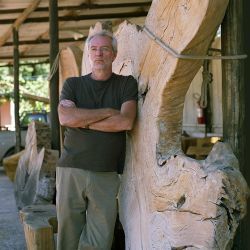 Since the late 1980s, he has developed "furniture sculptures", an expression used primarily by the critic Ethel Leon and adopted by the designer for his precision in describing the production he performs from forest and urban waste - trees naturally condemned by the action of inclement weather or by the action of man. The pieces created by the designer are born of a creative dialogue with the raw material: everything starts and ends in the tree. She is your inspiration; its shapes, holes, cracks, burn marks and the action of time provoke its sensitivity and lead to a carefully chosen design, a minimal intervention that generates unique pieces.